Volcano Kilauea: What stops eruptions of lava? Lava reaching temperatures of 1,000C and plumes of poisonous gas shooting up through cracks in the ground have forced hundreds of people on Big Island, Hawaii, to evacuate their homes. After the Kilauea volcano - one of the most active volcanoes in the world - erupted, slow-moving rivers of lava in the Leilani Estates area have covered more than 100 acres and destroyed dozens of structures in its path, including homes. So, do we know when it'll stop? The Kilauea volcano has been continuously erupting for 35 years. And it has been active for thousands of years. It's not the only volcano on Big Island, but is the "youngest and feistiest", said Vox. In 1990 an eruption caused about 200 hundred homes to disappear under lava. Image caption Lava fountains captured on 5 May. The pressure of the magma underneath the surface has not decreased, and there are no fundamental signs the decades-long eruption cycle is about to stop, says Hazel Rymer, professor of environmental volcanology at the Open University. There is little prospect of a reprieve any time soon and volcanologists are now anticipating new highly explosive steam-powered eruptions. But there are ways of forecasting whether the lava and molten rock, that has been fired into the air, might eventually cease. It all comes down to pressure. Why do volcanic eruptions happen in the first place? One way to think about how a volcano erupts is to compare it to a plumbing system, albeit one that extends miles below the earth's surface and is filled with boiling hot magma. Magma is called lava when it erupts. Lava comes out of ruptures in the Earth's surface, which are connected to pipes, or pathways underground, and a big crater that holds all the magma, like a lake. Underground, magma isn't free flowing, but rather travels by squeezing past solid rock, which can cause earthquakes. If the pressure is great enough miles underground, magma will be forced out of the crater, through new underground pathways, and shoot up through cracks in the ground known as fissures. There have been more than a dozen fissures recorded so far as a result of the eruption on Big Island. The pressure caused by the movement of magma built up, and caused a series of earthquakes, which contributed to the eruption. The specific cause of this eruption - what made the lava lake overflow and then collapse - hasn't been explained yet. The volume of magma in the lake dropped significantly - by more than 200m. Unfortunately we don't yet know why the level of the lava lake fluctuated so rapidly, says Dr Janine Krippner, a volcanologist at Concord University. Image caption The lava lake near the summit of the volcano has dropped by more than 200m. Do we know when it'll end? Lava is incredibly difficult to stop; it destroys whatever it touches and its path is unpredictable. In the past, attempts to impede the flow have included bombing it and building concrete barriers - with limited success. The best way to forecast whether the eruptions of lava are subsiding is to look at the signs that indicate the build-up of pressure underground. Experts will be scanning for seismic activity - to know if more earthquakes are predicted. If the ground is unstable, that is a sign the magma pressure is still high. GPS systems and a device called a tilt meter will also be used to measure the movement of the ground. More earthquake activity is expected, which would lead to new outbreaks of lava. As long as an eruption is being fed by magma, lava will continue to flow and spread across land, says Professor Steve Sparks, a volcanologist at Bristol University. The tropical climate of Hawaii is good for the natural recovery of the landscape and eventually, says Professor Sparks, vegetation will re-grow and soils will re-form. Once the lava cools, the chaos caused to parts of the island may take some time to undo. 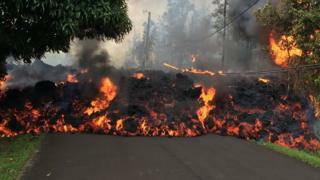 Bulldozers will be required to clear roads that have been deluged with lava that turns into rock.